Wash at cool temperatures and save energy. Clean your laundry in just 59 minutes. Get fresh-smelling clothes with Air Wash. Remove stains with Bubble Soak technology. Wash Cool, Save Energy: Save a huge amount of energy* by washing large loads at low temperatures using ecobubble™ technology. Bubbles activate detergent, so it quickly penetrates fabric and removes dirt easily - even in cool water (15°C). Powerful Cleaning in Less Than an Hour The new Samsung washing machine can complete your washing in just 59 minutes. It uses Speed Spray to rinse the clothes more powerfully, and accelerates the spin speed to complete the washing in just 59 minutes. Intensive Stain Removal: With the touch of a button Bubble Soak technology helps remove a variety of stubborn stains. Clothes are thoroughly soaked in bubbles, so stains are loosened and removed effectively. Guaranteed Durability: A Digital Inverter Motor delivers superior energy efficiency, minimal noise and exceptionally long-lasting performance, so its certified to work for 20 years* - backed-up by a 10 year warranty. Easy Trouble-Shooting: The Smart Check automatic error-monitoring system detects and diagnoses problems and provides easy troubleshooting solutions using a smartphone App. * So it saves you time and avoids the cost of engineer callouts! Chemical-Free Drum Sanitisation : For the ultimate in convenience, Eco Drum Clean technology keeps your front load washer fresh without using harsh chemicals. And it can even notify you automatically when it needs cleaning. Save Time on Smaller Loads: The Quick Wash programme is the perfect solution for your busy life - cleaning lightly soiled clothes quickly and efficiently, so you can enjoy more time for yourself. Gentle Fabric Care: The Diamond Drums unique "soft curl" design with smooth, diamond-shaped ridges is supremely gentle on your clothes. Its small water exit holes also help protect fabric by preventing clothes from becoming trapped. 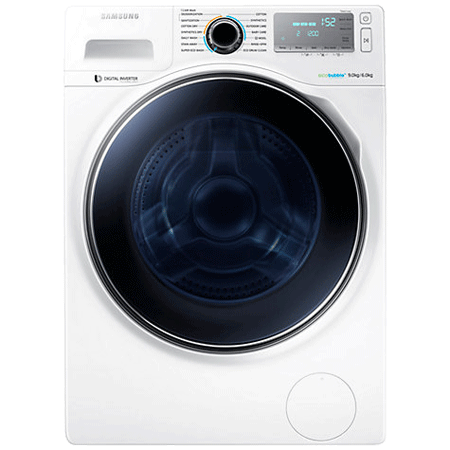 9kg Washer / 6kg Dry..
Pay an initial 10% Deposit of £59.90. A £29 settlement fee is payable at the time of final payment. Settle the balance in 12 months interest free.